It is a sunny afternoon in Coral Gables, with a light breeze gently waving the flags atop the press boxes and luxury suites at Mark Light Field. In the bullpen, a pitcher walks back to the rubber and toes it again. Some dirt has kicked up on his sacred spot exactly 60 feet and 6 inches from home plate. He sighs. Methodically, pitcher Andy Suarez rearranges the burnt orange dirt on the mound and peers toward his catcher. A bead of sweat trickles down his forehead. Fastball, the lefthander signals to his catcher with a flick of his glove. Suarez becomes set and unfurls the pitch. The baseball screams through the air, whizzing and whirring until it pops the catcher’s mitt. “Nice pitch! One more,” barks the pitching coach, watching his prized pitching prospect nearby. Suarez nods, knowing it is his last of the afternoon. His catcher positions himself on the outside of the plate and raises his glove. Staring down the catcher’s mitt, Suarez signals again and blazes a fastball over the outer half of the plate. His catcher barely has to move. The pitching coach nods approvingly to the pitcher and catcher, and the trio embark toward the dugout preparing for another season of Miami Hurricanes baseball. Yet, staff ace Suarez was not supposed to be throwing in the Hurricanes’ bullpen this spring, at least according to baseball industry insiders. Last summer, Suarez was selected 57th overall by the Washington Nationals in the 2014 MLB Draft. Just a few rounds later, Washington selected Suarez’s center fielder and Hurricane teammate Dale Carey. Analysts around the game figured it was a foregone conclusion that Suarez would sign. After all, he didn’t sign when he was drafted out of high school, and he tore his labrum soon after. Plus, Washington offered him almost a million dollars. Yet, Suarez told Hurricanes head coach Jim Morris he was returning. Morris, as surprised as anyone, expected Suarez to sign even after his pitcher alerted him of his intentions to stay at Miami. 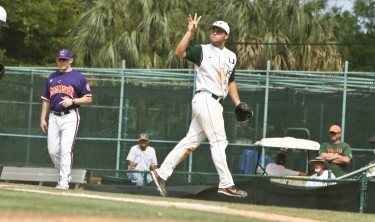 The decision to return was not always clear for the Hurricanes starting pitcher. Last year, Suarez compiled a 6-3 record with a 2.95 ERA and led Miami in innings pitched. He also struck out 87 batters while only allowing 15 walks. His two-fold combination of accuracy and durability was attractive to pro scouts, and also earned him third-team All-ACC recognition. Suarez, who is a redshirt junior, will graduate this spring with a degree in criminology. Being able to graduate from UM played a role in his decision. “I’m glad I am back. I am graduating this year, so it’s a win-win for me,” he said. This season, Suarez returns to Coral Gables as the undisputed ace of the pitching staff. Suarez, a built 6-1 left-handed pitcher, is the only returning member from last year’s rotation. While some have doubted his decision to return, this is not Suarez’s first time ignoring the allure of professional play. The Toronto Blue Jays selected Suarez, who pitched locally at Christopher Columbus high school, in the ninth round of the 2011 MLB Draft. People around the Blue Jays organization expected Suarez to sign; yet, he did not. Suarez was a three-time All-Dade First team pitcher, two-time All-Florida First team pitcher, and a consensus top pitching prospect in South Florida following his senior campaign at Columbus. Suarez opted for school instead of dollars and decided to suit up in green and orange for the University of Miami. Now, Suarez has again spurned the pro ranks in order to return to Coral Gables. This year, Suarez leads a team featuring preseason All-Americans Zack Collins and Bryan Garcia and tantalizing talents like Willie Abreu. 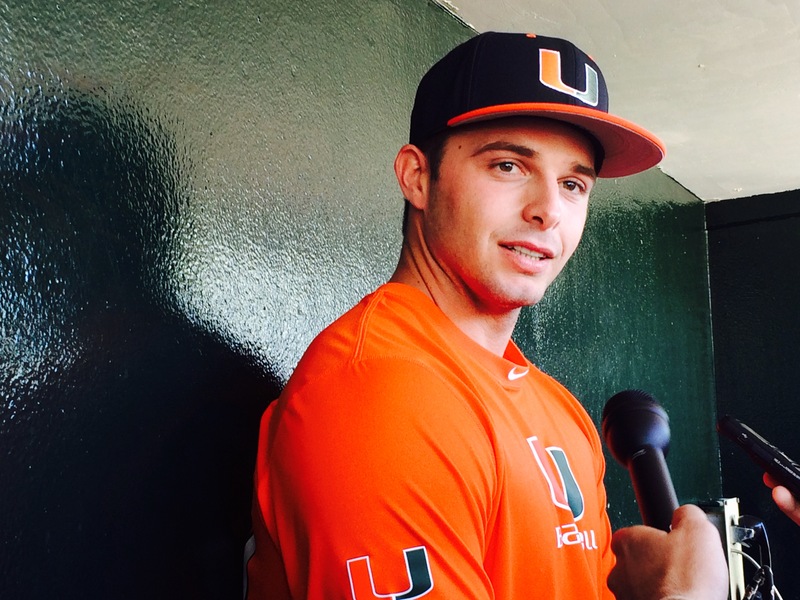 Suarez will take the mound 7 p.m. Friday in the Canes’ opening game against Rutgers.